"41AN38, 97, 1" by Timothy K. Perttula and Robert Z. Selden Jr.
DECORATION: The upper panel is plain, while the lower panel has a series of triangular and circular engraved motifs that are repeated seven times around the vessel. The circles, with small hatched pendant triangles, alternate with the triangular motif, which consists of two triangles that touch at their apex in the central part of the lower panel; the double triangle motif is also seen in examples of Poynor Engraved, var. O in the upper Neches River basin, but examples have hatched triangles. Four of the engraved triangles have triangular hatched areas at each corner of the larger triangle, while three have negative ovals within the larger triangles, outlined by a series of curvilinear hatched lines at the corner of the larger triangles. There is also a single engraved triangle on the interior surface of the upper rim panel. TYPE: Poynor Engraved, local variety 2 at the Lang Pasture site (Perttula 2011:Figure 6-29b). 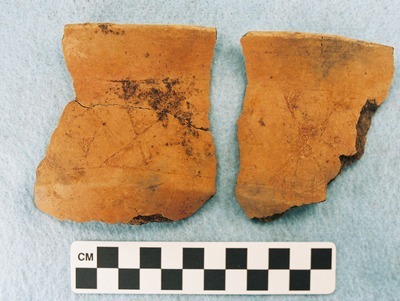 Poynor Engraved, local variety 2, compound bowl sherds from Feature 91, Vessel 1, at the Lang Pasture site.